I graduated from college in 1997 — ten years ago this year. I started teaching during the 1997-1998 school year. I taught at a poor, rural school in Middle Georgia. We didn’t have computers in the classroom. I can’t remember a computer lab or other widespread computer access, but I do remember we had to save our grades on a computer disk. I did mine on a laptop that had been a graduation gift. I can’t remember what the other teachers did. I realize that we had less than many other schools; the school where I did my student teaching had two computer labs. My supervising teacher had a computer in her classroom, but I think that was because she was the Journalism teacher and needed it to lay out the newspaper. For the next three years, I taught at my alma mater, Warner Robins High, and we had classroom computers. We had a document camera in one classroom, and we thought it was amazing. I know we had a lab, but it was difficult to get into. I had to plan far in advance for time in the lab. This is probably still true in many places. I left that school in the year 2001. I taught pre-K for a year, then returned to public schools, teaching middle school in suburban Atlanta. Again, we had a computer lab, but competition was even more fierce. I observed a class and saw my first online scavenger hunt, and I thought it was amazing. A fellow teacher had students reading online articles to learn about the Middle East. A peer showed us how to create Jeopardy games using Power Point software. It was hard to get my hands on the projector, however. I began teaching at Weber in the year 2004. 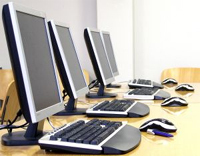 I had a computer in my classroom and access to computer lab most of the time when I needed it (provided someone hadn’t signed up before me — which rarely happened, and not because no one used it, but because our school is small). One of our teachers used a SMART Board. I couldn’t even imagine all it might do. When we moved into our new building, I received a SMART Board. We have two sizable computer labs with new computers. All of us who had computers older than two years old received new classroom computers (I was one). The SMART Board has so completely transformed my teaching that I’m not sure how I did without it. I introduced my colleagues to blogs and wikis in the classroom on our January staff development day. Widespread use of laptops. I would say about 20-50% of my students use them, but I do teach at a somewhat affluent private school. In the future, as laptop prices drop and schools become forced to be more open to technology, I think laptops will be everywhere. Interactive white boards (SMART boards) will be commonplace. Mine has transformed my classroom, and I cannot help but feel it will have a similar effect on others. Blogging and wikis will be used widely in education; in many circles, they may be required. The middle school where I worked required us to use School Notes. I think my administrators are reluctant to require all teachers to have websites, but mine has been well-received by parents (even if it hasn’t quite been used by the students as much as I wish they would). Increasingly, teachers will be responsible for teaching students to navigate the sometimes murky waters of technology; lest we hope such education would be relegated to parents alone, I remind you (or inform you, if you didn’t know) that character education is required by the state of Georgia. Students will increasingly produce products such as videos, podcasts, websites, and the like for school. Students might one day opt for distance learning, plugging in to a school across the country, if they wish, to learn from the comfort of their own home. That barely scratches the surface. What do you think the future holds in store for education? I am a middle school principal in Pennsylvania. At our last superintendent's meeting we began to discuss 21st century learning. I think your video/podcast is excellent, but I think the idea having teachers sit in a room and try to create a similar video would be a fantastic exercise. We need to begin to concieve of education with a new focus, that of a world view instead of a view that encompasses only our borders. Bill, I didn't create the video. It was created by Karl Fisch, but I agree it's an interesting video. And I like your idea about having teachers work together, too.